The coming of Fall always meant the smell of burning leaves in Northern New Jersey...I remember floks raking leaves to piles on the curb...the burning and watching them burn all afternoon..
Wow! Way before political correctness and such. 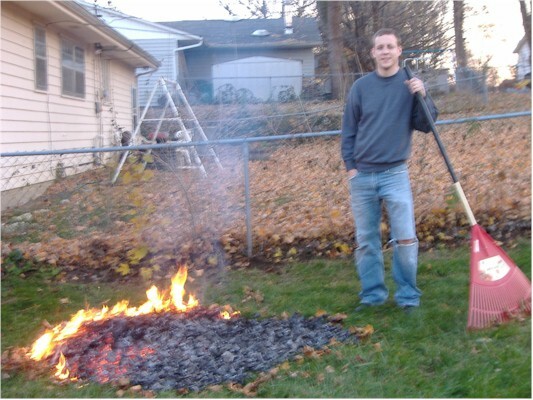 When we kids back in Orange County, CA, it was standard practice burning leaves in our backyard. I do not know if they still do it, but some farmers actually set their fields afire after harvesting their crop, especially in Oregon! Those days "carcinogenic" was a word confined to the Sunday crossword puzzle. raked the leaves & set fire to them by the front curb-everybody burned their leaves on saturday. Ah, a true scent of autumn! I remember when one of the our chores was to "burn the papers." We had to empty all the wastebaskets in the house, take them out to the far backyard and burn them in an old metal drum. Of course, more than once we accidentally set the open field behind our house on fire. Good times!